The goal of ecological stream restoration is to restore the stream ecosystem's physical, chemical, and biological composition to its native state. Ecological stream restora tion includes restoring the natural physical and biotic dynamic nature and species diversity, which leads to increased functionality in regard to energy flow and nutrient cycling. In its purest sense, stream restoration strives to achieve the most natural system possible in a given area. In most areas of the world, this means return ing the stream to a pre industrialization form. In North America, restoration goals typically attempt to reach pre European settlement form. There are several intrinsic problems with this approach, the most obvious being that the parameters of the system before anthropogenic alterations are difficult to determine. If the parameters are known, there may be little chance that these stream conditions could be realistically reached without completely removing all human influence from the watershed. The problem of unrealistic recovery goals has led to the use of more defining terms for restoration such as rehabilitation and recovery, which imply restor ing the stream as close as realistically possible to the predisturbed state. The term stream restoration is also different from stream management. Restoration is a type of stream man agement (although more restrictive), and is differentiated by its goal to bring the system to a more natural state (although many do have alternative incentives), while management goals can be broader and could include more socially or economically driven targets. Many of the same strategies used in stream restorations are imple mented in stream management projects, for example, environmental engineering, conservation, adaptive man agement, as well as ecological engineering. Stream management practices frequently require a more immedi ate response necessitating greater effort, as management often addresses certain stream aspects that must be dealt with in a timely manner and directly affect human activ ities, such as flood control and drinking water quality issues. When implementing ecological restoration, results often take more time to appear, for example, several generation times for species of interest. The cost and effort applied to both management and restoration projects are extremely variable and project specific; however, the use of ecological engineering may reduce costs for both types of projects. A common ecological approach is to eliminate or reduce a pollutant or human disturbance and let the ecosystem recover on its own with minimal human interference. In the long run this approach may be the most cost effective and ecologically sound, as there is minimal collateral damage to the stream ecosystem during restoration activities. For instance, damage to riparian and floodplain habitat by large equip ment during physical channel modifications, or near stream pump and treat groundwater decontamination activities can be avoided. 1. Ecological based goals that strive to achieve a more stable, resilient, and natural system. 2. Collection of prerestoration data to establish a known ecological starting point. 3. An attempt to understand and address basic stream ecosystem processes and interactions, including site specific and season specific interactions between eco system components. This understanding is critical to reduce the potential of unintended ecological responses to restoration activities. 4. A postrestoration monitoring program implemented to determine if ecological integrity has improved, and continues to improve with minimal human mainte nance. Restoration monitoring is an important aspect of the process. However, determining which aspects of the project provide the best estimate of progress must be carefully decided, and will most likely depend on site conditions and restoration goals. 5. 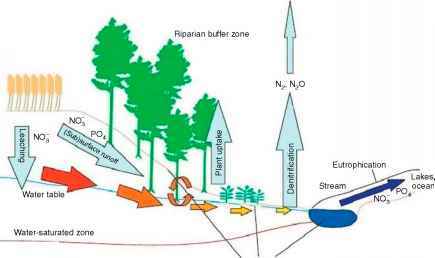 Minimize damage to the stream while performing restoration activities.